The Bay of Quinte /ˈkwɪnti/ is a long, narrow bay shaped like the letter Z on the northern shore of Lake Ontario in the province of Ontario, Canada. 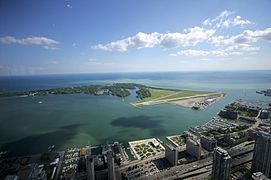 It is just west of the head of the Saint Lawrence River that drains the Great Lakes into the Gulf of Saint Lawrence and it is located about 200 kilometres east of Toronto and 400 kilometres west of Montreal. The name Quinte is derived from Kenté, which was the name of an early French Catholic mission located on the shore of what is now Prince Edward County. 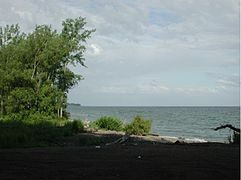 Officially, in the Mohawk language, the community is called Kenhtè, the Cayuga name is Tayęda, ne, gęˀ or Detgayę, da, negęˀ, land of two logs. The Bay, as it is locally, provides some of the best trophy Walleye angling in North America as well as most sport fish common to the great lakes. 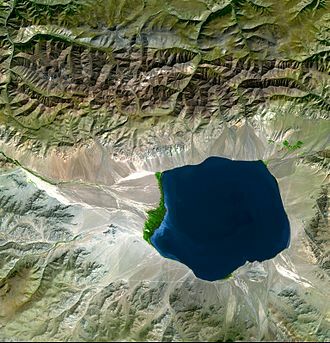 The bay is subject to algae blooms in summer which are a naturally occurring phenomenon. 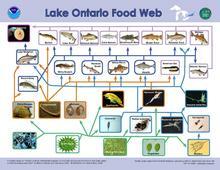 Zebra mussels as well as the invasive species found in the great lakes are present. Illegal sales of liquor accounted for many fortunes in and around Belleville, tourism in the area is significant, especially in the summer months due to the Bay of Quinte and its fishing, local golf courses, provincial parks, and wineries. 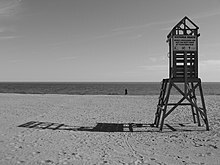 The northern side of the bay is defined by Ontarios mainland, beginning in the east with the outlet to Lake Ontario, the bay runs west-southwest for 25 kilometres to Picton, where it turns north-northwest for another 20 kilometres as far as Deseronto. From there it turns south-southwest again for another 40 kilometres, running past Big Island on the south, the width of the bay rarely exceeds two kilometres. The bay ends at Trenton and the Trent River, both on the north side, the Murray Canal has been cut through the Carrying Place, the few miles separating the end of the bay and Lake Ontario on the west side. The Trent River is part of the Trent-Severn Waterway, a canal connecting Lake Ontario to Lake Simcoe, there are several sub-bays off the Bay of Quinte, including Hay Bay, Big Bay, and Muscote Bay. The Greater Bay of Quinte area includes the municipalities of Brighton, Quinte West, Prince Edward County, overall population of the area exceeds 200,000. 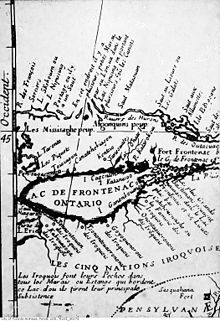 The Mohawks of the Bay of Quinte on traditional Tyendinaga Mohawk Territory and their reserve Band number 244, their current land base, is a 73 km² on the Bay of Quinte in southeastern Ontario, east of Belleville and immediately to the west of Deseronto. The Niagara River is a river that flows north from Lake Erie to Lake Ontario. 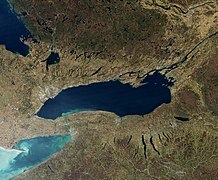 It forms part of the border between the province of Ontario in Canada and the state of New York in the United States, there are differing theories as to the origin of the rivers name. According to George R. Stewart, it comes from the name of an Iroquois town called Ongniaahra, the river, which is occasionally described as a strait, is about 58 kilometres long and includes Niagara Falls in its course. 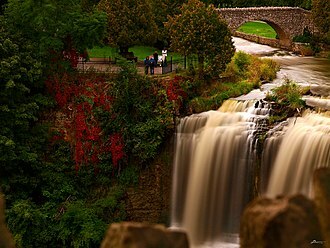 The falls have moved approximately 11 kilometres upstream from the Niagara Escarpment in the last 12,000 years, the diversion of the river for electrical generation has significantly reduced the rate of erosion. Power plants on the river include the Sir Adam Beck Hydroelectric Power Stations on the Canadian side, they generate 4.4 gigawatts of electricity. The International Control Works, built in 1954, regulates the river flow, ships on the Great Lakes use the Welland Canal, part of the Saint Lawrence Seaway, on the Canadian side of the river, to bypass Niagara Falls. The total drop in elevation along the river is 99 metres, the Niagara Gorge extends downstream from the Falls and includes the Niagara Whirlpool and another section of rapids. The Niagara River features two large islands and numerous smaller islands, grand Island and Navy Island, the two largest islands, are on the American and Canadian sides of the river, respectively. Goat Island and the tiny Luna Island split Niagara Falls into its three sections, the Horseshoe Falls, Bridal Veil Falls, and American Falls, unity Island lies further upstream, alongside the city of Buffalo. The Niagara River and its tributaries, Tonawanda Creek and the Welland River, formed part of the last section of the Erie Canal, after leaving Lockport, New York, the Erie Canal proceeds southwest until it enters Tonawanda Creek. 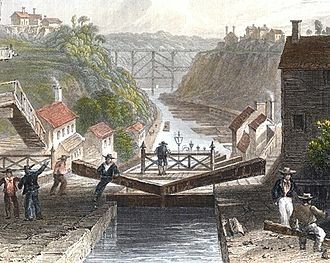 The Welland Canals used the Welland River as a connection to the Niagara River south of the falls, allowing traffic to safely re-enter the Niagara River. The Niagara River and Falls have been known outside of North America since the late 17th century, when Father Louis Hennepin and he wrote about his travels in A New Discovery of a Vast Country in America. Fort Ontario is a historic fort situated by the City of Oswego, in Oswego County, New York in the United States of America. 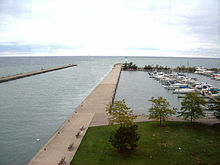 It is owned by the state of New York and operated as a known as Fort Ontario State Historic Site. Fort Ontario is located on the east side of the Oswego River on high ground overlooking Lake Ontario, Fort Ontario was one of several forts erected by the British to protect the area around the east end of Lake Ontario. 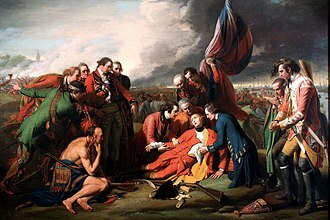 The original Fort Ontario was erected in 1755, during the French, at that time its name was the Fort of the Six Nations, but the fort was destroyed by French forces and rebuilt by British forces in 1759. 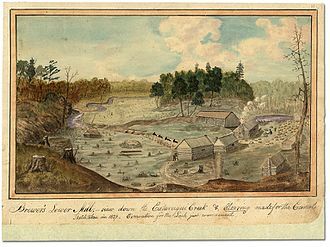 At the conclusion of Pontiacs War, Pontiac urged moderation and agreed to travel to New York, during the American Revolutionary War, a detachment from the 3rd New York Regiment destroyed the fort in July,1778, after the British abandoned it. The British returned and rebuilt the fort in 1782, there was an aborted attack on the fort by Colonel Marinus Willet in 1783. The British held the fort after the war was over until 1796 after the signing of Jays Treaty, the fort was attacked and destroyed by British forces during the War of 1812 in the year 1814. 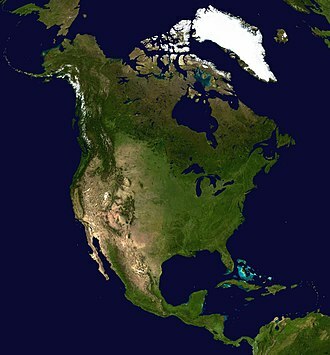 After a period of disuse, new construction was undertaken in part because of tensions with Great Britain as well as to check smuggling activities between Canada and the United States. During the American Civil War the new construction began at the fort because of fear of British help from Canada to the South, although the fort remained a military base, the fort itself fell into ruin, since funds were used to create more modern quarters outside the fort. The 2nd Brigade of the U. S, 1st Infantry Division called Fort Ontario home until the brigade was deactivated on June 1,1940. During World War II, Fort Ontario was home to approximately 982 Jewish refugees, the Fort Ontario Emergency Refugee Shelter was the only attempt by the United States to shelter Jewish refugees during the war. 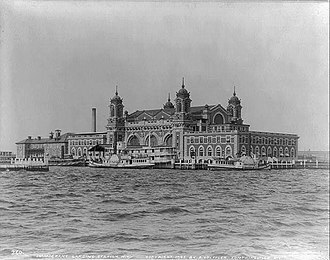 After the end of the war the refugees were kept in internment because of disagreements concerning whether or not to them to become United States citizens. 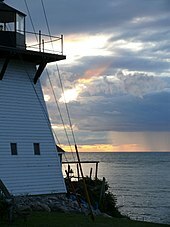 Oswego /ɒsˈwiːɡoʊ/ is a city in Oswego County, New York, United States. The population was 18,142 at the 2010 census, Oswego is located on Lake Ontario in north-central New York and promotes itself as The Port City of Central New York. It is the county seat of Oswego County, the city of Oswego is bordered by the towns of Oswego and Scriba to the west and east, and by Lake Ontario to the north. Oswego Speedway is a nationally known automobile racing facility, the State University of New York at Oswego is located just outside the city on the lake. 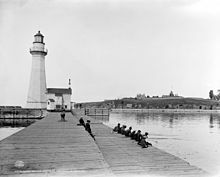 Oswego is the namesake for communities in Montana, Illinois, the British established a trading post in the area in 1722 and fortified it with a log palisade called Fort Oswego. The first fortification on the site of the current Fort Ontario was built by the British in 1755, Fort Ontario was destroyed by the French upon capturing it in the Battle of Fort Oswego, during the French and Indian War. 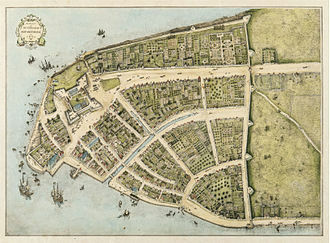 Construction of a second British fort began on the site in 1759. 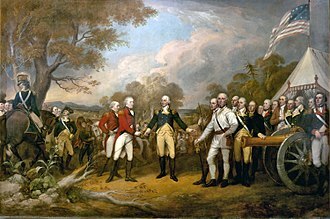 During the American Revolution, the British abandoned the Fort, and in 1778, in 1782, the British reoccupied Fort Ontario, and didnt forfeit it to the U. S. until 1796, thirteen years after the cessation of hostilities in the Revolution. 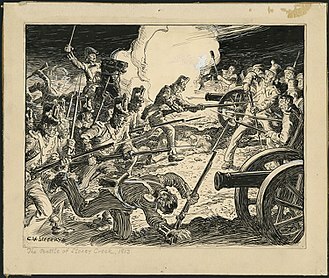 During the War of 1812, a weaker American garrison at Fort Oswego was overwhelmed by superior British forces, throughout the 19th Century, the U. S. military maintained a presence at Fort Ontario. During WWII the Fort was used to house interned persons, mainly Jewish refugees, in 1946, the Fort was transferred to the state of New York. At that time, it was used to house veterans and their families during the post-war period, development of the fort as a historic site began in 1949, which included the Safe Haven Museum. The current fort was built between 1839 and 1844, major masonry improvements to the forts outer wall were undertaken, but left incomplete when in 1872, Congress canceled its funding. By 1901, the old fort was abandoned, Fort Ontario is being restored to its 1867–1872 appearance. 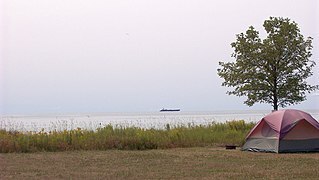 Presquile Provincial Park is a park in southeastern Northumberland County on the north shore of Lake Ontario near the town of Brighton in Ontario, Canada. 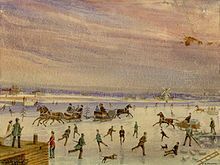 The park occupies an area of 9.37 km2, the name of the park is the French word for peninsula, or literally almost island, and was believed to be named by Samuel De Champlain on his second expedition. 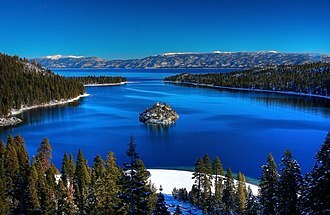 The park area was formed when an island was connected to the mainland by a sand spit. The parks wetlands are one of the wetlands along the north shore of Lake Ontario, and are noteworthy for the many sand ridges running through them. The mixture of sand dunes and forests leads to high plant diversity. In some ways, the flora of this site is similar to the much larger sand spit at Long Point. 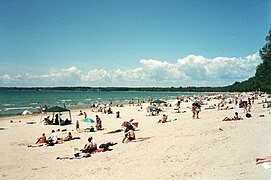 The long sand spits in Presquile create natural vegetation gradients from sand dunes and pannes to coniferous and deciduous forest, sand dunes and pannes are uncommon along the north shore of lake Ontario. Pannes are an unusual moist sand habitat and seasonally flooded and this creates situations with high plant diversity. The pannes support many plants, such as Carex aurea, Cladium mariscoides, Scleria verticillata, Parnassia glauca. The colourful pink flowers of the Physostegia are a good indicators of panne habitat during the summer, because of their scarcity and scientific importance, these wetlands have been used to develop and test general models for factors affecting diversity in plant communities. In drier conditions, these pannes grade into more typical sand dune vegetation, in wetter conditions, they grade into rich marshes and sedge meadows, which intergrade with forested sand ridges in the Fingers. This rare and distinctive vegetation type is not mentioned in the resource management plan. 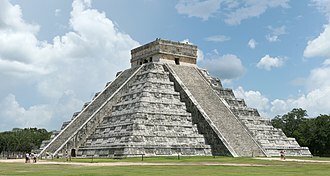 And has been damaged in the past by such as road construction. The dunes and wetlands arise out of natural processes, such as the natural high, both the area of wetlands, and the number of plant species in them, depends upon a combination of high water and low water years over decades. The parks location on Lake Ontario makes it a stop over for migrating birds along the Michigan Flyway. Recreational fishing at Oswego, c. 1900. Porte des Cinq Nations. Beginning in 1756, the main entrance to Fort Niagara was established at the southern bastion, on the side of the Niagara River. The French named this gate the Porte des Cinq Nations', that is the Gate of the Five Nations, in honor of the Iroquois Confederacy. Indian Point of Cressy Point, easternmost point of Prince Edward County and entrance to the Bay of Quinte. 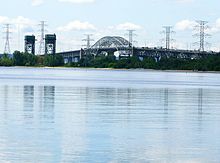 The Burlington Bay James N. Allan Skyway bridges the waters of Hamilton Harbour.